WASHINGTON — Alaska Sen. Lisa Murkowski will vote "no" on confirming Betsy DeVos, President Donald Trump's nominee to head the U.S. Department of Education, she announced Wednesday. Murkowski's announcement on the Senate floor — mirrored by fellow Republican Sen. Susan Collins of Maine — threw the controversial nominee's confirmation into doubt. Republicans hold a slim 52-member majority in the Senate, and confirmation requires 51 votes. The vote appears to be headed for a 50-50 split, wherein Vice President Mike Pence would cast the deciding vote. The 48 Democratic and Independent senators all appear unlikely to back DeVos in a vote that will likely occur early next week. Upon Murkowski and Collins' announcements, attention quickly turned to Republican Sens. Pat Toomey of Pennsylvania and Dean Heller of Nevada who have announced plans to support DeVos, but have not made a final decision. Alaska Sen. Dan Sullivan said he plans to vote in favor of DeVos. DeVos is a billionaire from Grand Rapids, Michigan, who along with other family members is known for being a GOP megadonor. DeVos family members gave $43,200 to Murkowski's campaign over the last election cycle. They donated $23,400 to Sullivan's 2014 campaign. DeVos is also a longtime charter-school advocate who has pushed for using public funds to support alternatives to public schools. Opponents of her nomination criticize her lack of experience and question her dedication to public schools. Murkowski's announcement comes one day after she and Collins voted to move DeVos' nomination to a full Senate vote; both are members of the Health, Education, Labor and Pensions Committee. Members of the committee have been the subject of a weekslong campaign urging them to vote against DeVos. 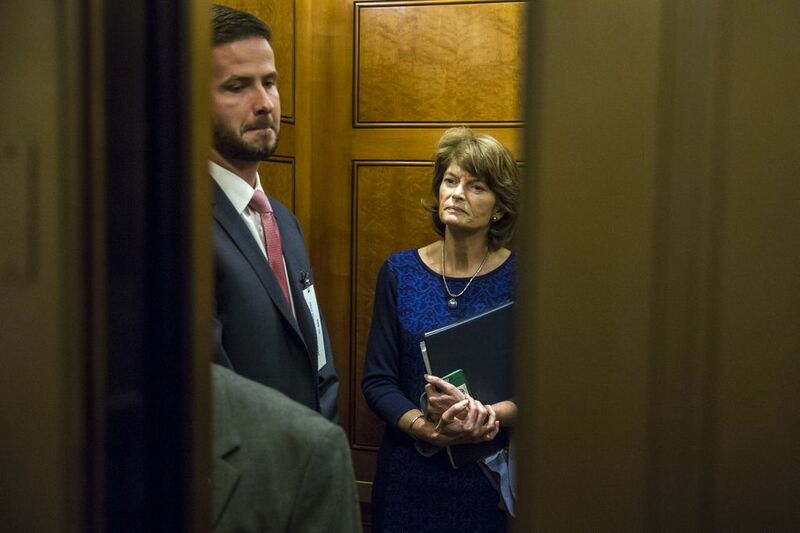 Citizens have overwhelmed Murkowski's office phone lines with tens of thousands of voicemails, in addition to phone calls, emails and in-person visits and protests in Alaska and Washington, D.C. The concerns of thousands of Alaskans who contacted Murkowski, she said, "center, as mine do, on Mrs. DeVos' lack of experience with public education and the lack of knowledge that she portrayed in her confirmation hearing." "Alaskans are not satisfied that she would uphold federal civil rights laws in schools that receive federal funds. They questioned her commitment to students with disability rights under (the 1975 Individuals with Disabilities Education Act). They fear that the voucher programs that are intended to serve them may actually rob them of the ability to benefit from an education in an inclusive environment with their nondisabled peers," Murkowski said. But Murkowski said that in hearings, correspondence and hours of one-on-one discussion, DeVos made several promises: She would not push vouchers on Alaska or act to "undermine, erode or ignore public schools," and she would visit Alaska herself. Sullivan said Wednesday he was satisfied with DeVos' promises and her commitment to shifting more decision-making to local school districts. Deena Mitchell, co-founder of public school advocacy organization Great Alaska Schools, said the group was very pleased with Murkowski's decision. And "we are certainly encouraging Sen. Murkowski to share with Sen. Sullivan … why she came to the conclusion that she came to" about DeVos, she said. "While I share many of the concerns of Sen. Murkowski, after meeting with Mrs. DeVos, she committed to me that she will work with all Alaskans to strengthen education throughout the state, in both public and private schools. She committed to implementing the Every Student Succeeds Act as Congress intended it, without implementing regulations that place the power into the hands of the Department of Education, and supports accountability for all schools as determined by the states," Sullivan said. "But I still continue to have concerns," Murkowski said. "I think that Mrs. DeVos has much to learn about our nation's public schools: how they work and the challenges they face. And I have serious concerns about a nominee to be secretary of education who has been so involved in one side of the equation, so immersed in the push for vouchers, that she may be unaware of what is successful in the public schools and also what is broken and how to fix them. "I cannot support this nominee," Murkowski said.